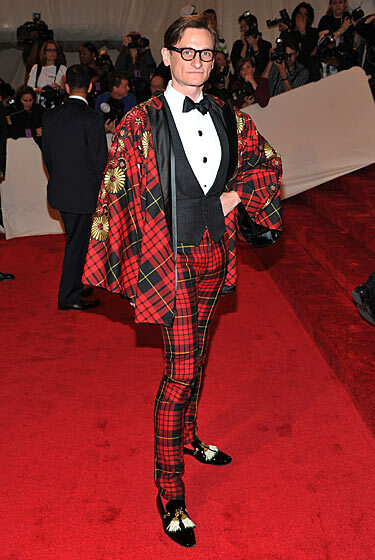 Hamish Bowles, couture collector, existential exhibitionist (he contributed to Savage Beauty as well) and culture vulture – paid proper ode to Mr. McQueen – in mad plaid. 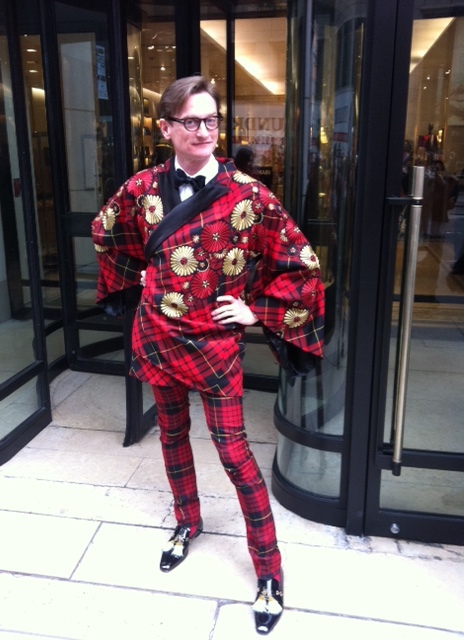 Hamish Bowles is mad for plaid, in McQueen and custom Louboutin. Photo: Barneys NY. A checkered character, indeed. Photo: Getty. There was no skirting the issue – wearing tartan in any form on this red carpet is a tribute to McQueen. Marc Jacobs and Robert Duffy are a hit in kilts - a lovely and cheeky homage to McQueen. Photo: Getty. Alexander McQueen and Sarah Jessica Parker at the Met Gala, 2006 - a memorable moment. Photo: Getty. The tartan is attributed to McQueen’s highland heritage. He wore a kilt to Isabella Blow’s funeral and there was a solemn moment at McQueen’s own memorial, with kilted bagpipers, which is forever etched in my memory. I still get a lump in my throat when I think of it. Hamish, avec entourage. Photo: Vogue.com. Some of my favourite pieces are from the Fall Winter 2006 collection, which was filled with it. Lacy lass at McQueen, FW06. That is Indian zardozi embroidery and so genius to incorporate part of the logo like that. Photo: Style.com. Highland honey. McQueen FW06. Photo: Style.com. And while he may not have worn tartan, I liked Tommy Hilfiger’s red and black tribute as well. Tommy and Dee Hilfiger - he looked great in red and black. Photo: Getty. It, of course, reminded me of the masterful red and black drama of Fall Winter 2009. Breath. Taking. Photo: Fabric Mag. Keeping with the tartan tradition, but breaking out the Blackwatch, was one Sir Paul McCartney.